Bhopal: Heavy rainfall continues to batter many places of Madhya Pradesh with the intensity shifting towards western MP on Thursday. Normal life has been thrown out of gear in districts like Khargone, Rewa and Satna. The Regional Meteorological Centre (RMC) in Bhopal has issued warning for more rainfall across state. High alert for excessive rainfall has been issued for Khargone, Khandwa and Barwani districts during next 24 hours. Overall, the entire state is on orange alert, which is an indication for the administration to be prepared for heavy rainfall scenario. Rainfall is likely to continue, with differing intensity till July 16, the MeT office has said. Alert for heavy rainfall has also been issued for districts of Ujjain division and Sagar, Rewa, Damoh, Indore, Panna, Burhanpur, Vidisha and Katni districts. Very heavy to heavy rainfall warning (intensity lower than alert) is in place for Sehore, Hoshangabad, Harda and Rajgarh districts, while heavy rainfall warning has been issued for rest of Indore division, Bhopal, Vidisha, Raisen, Betul, Chhindwara and Seoni districts. 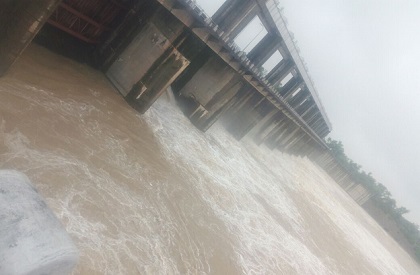 Heavy rainfall during past four days has thrown life quite out of gear in the Vindhya region in northeast MP comprising Rewa and Satna districts while some areas in Bundelkhand region like Katni, Damoh and Sagar have also been impacted. Rewa remained one of the most impacted with waterlogging reported from urban as well as rural areas. Rain continues in the region, but the MeT office has indicated some relief as the intensity is likely to reduce during next two days. However the impact of rainfall – occurring under influence of a low pressure system over south UP and adjoining northeast MP – has shifted westwards, taking the districts in Nimad region (Khargone, Khandwa, Barwani) in its grip. The Kunda river and its subsidiary rivulets in Khargone was overflowing, cutting of the road connectivity in many places. The Diwali and Bandhani rivulets were flowing over culverts cutting off the Khandwa-Baroda highway. With warning for more rain in place, the administration be better prepared for eventualities, the MeT office has indicated. Meanwhile, this monsoon, Bhopal has been deprived of its usual quota of rainfall by a big margin. Though under the influence of current system, the city and district started receiving rainfall since midnight of Wednesday, but the intensity was not too much. The rainfall amount recorded till 8.30am on Thursday was 11.4mm of Bhopal airport and 23.2mm for Bhopal city. Bhopal district has till now (June 1 to July 13 morning) received just 125.1mm of rain, which is 167.4 (almost 52%) less than that expected till this time. Bhopal had received more than average rainfall last year, but this time, the rain scene has not been too satisfactory in the capital till now.